Scientists at the University of Aberdeen are putting an eye in the sky as they investigate a potential new method to prevent catastrophic damage to soft fruit crops in the UK. They are using drone technology in a bid to create a new monitoring system for the fruit fly Drosophila suzukii. Also known as Spotted Wing Drosophila, the pest has become a serious threat to growers since it arrived in the UK from mainland Europe, affecting many commercial fruit crops including strawberries, raspberries and grapes. Early detection is crucial to prevent it from devastating crops, however traditional monitoring methods are time-consuming and costly. 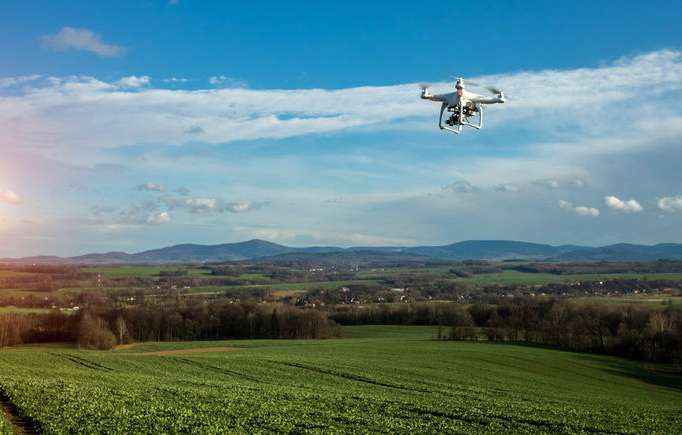 The University of Aberdeen has been selected alongside European partners to investigate the possibility of using drones to monitor, identify and alert growers to the presence of the fly so that they can take swift action to prevent crop destruction. The three-year project, which is funded by the Department for Environment, Food & Rural Affairs (Defra), also involves Dr. Johannes Fahrentrapp at the Zurich University of Applied Sciences in Switzerland and Dr. Lammert Kooistra the University of Wageningen in the Netherlands. Dr David Green, from the University of Aberdeen, said: "Since it arrived in the UK in 2012 Drosophila suzukii has spread rapidly to become a real threat to soft fruit growers, particularly in the main fruit growing areas in the south-east, although it has been found as far north as Dundee. "Early detection is key to prevention, however current monitoring methods usually involve manually checking traps for signs of the fruit fly, which is very time-consuming and inefficientif you are going from trap to trap over acres of land. "What we are aiming to develop is an automated system where drones fitted with cameras would fly over so-called 'sticky traps' which would trap the fly but in a way that allows it to be identified from the air. "One of the main challenges of our work will be developing a method that automatically identifies the presence of the fly among other pests. "Our Dutch partners at the University of Wageningen are specialists in image processing, and our aim is to develop an image-capturing and processing system that can recognise the fly and carry out an automatic count in order to determine the density of the infestation. "From there a fast alert can be issued to growers and they can undertake the necessary action to prevent the destruction of their crop, which in many cases can amount to many thousands of pounds. "Ultimately, our goal is to develop a system which has real value for soft fruit growers - many of whom operate on tight margins - that can help protect their livelihoods."